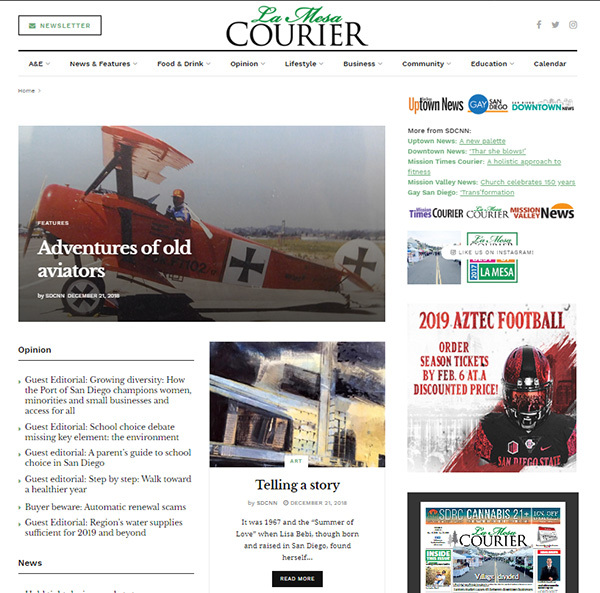 Online readers of La Mesa Courier may have noticed a few changes to the design of the paper’s website over the last few months. In an effort to update its online presence, La Mesa Courier parent company SDCNN set out at the end of 2018 to revamp all six of the community newspaper group’s websites. In addition to cleaning up outdated categories and a layout that wouldn’t load correctly to smartphones and tablets, the update gave each paper an opportunity to offer more content for readers. For example, in the online News section under Politics, readers can find articles from city, county and state representatives that do not always make it into the print editions of the paper. A new Business section will have real estate and finance articles as well as house our “Expert Advice” articles, sponsored links and Best of La Mesa Courier winners. The Arts & Entertainment section of the website includes arts, theater, film and books articles from around the region. Under the Lifestyle section, travel, fashion, pets and fitness articles that appear in other SDCNN papers are now shared with La Mesa Courier readers. The new site also provides the editorial staff at La Mesa Courier to add additional online content such as videos, podcasts and photo galleries. Look in the print edition for prompts about any additional online-only content. Visit lamesacourier.com to poke around and get familiar with the new website. In an ongoing commitment to communicate with residents, the La Mesa City Council will host two town hall meetings. These open-forum sessions provide an opportunity for citizens to share concerns, ideas, and opinions on issues in their neighborhood and throughout the city. The first meeting will be held on Tuesday, Jan. 29, at La Mesa Dale Elementary, 4370 Parks Ave. The second meeting will be held on Thursday, Jan. 31, at Murray Manor Elementary, 8305 El Paso St. Both meetings will be held from 6:30 to 8:30 p.m.
Further information about these meetings is available by calling the City Manager’s office at 619-667-1105 or emailing cmoff@ci.la-mesa.ca.us. La Mesa Chamber of Commerce’s Homebound Senior Project — a holiday drive to bring essentials to 24 homebound seniors — brought in a total of 3,804 items that were either donated or purchased. In addition to La Mesans’ generosity in supporting the project, the chamber received donations of food, toiletries, and other items to us from people in San Diego, Santee, El Cajon, Little Italy and Spring Valley. Besides the food and toiletries, a group of women participated by crocheting or quilting handmade blankets for the homebound seniors. The donated items included 1,750 non-perishable food items such as vegetables, pasta, cereals, soups, sauces, beans; 905 stationery items such as writing tablets, paper supplies and calendars; 711 toiletry items such as soaps, shampoo, toothpaste, toothbrushes, lotions, etc. ; 254 clothing and home items; 120 miscellaneous items; and 74 gift cards. In addition to these items, cash and gift cards were also donated by local businesses and community members. The chamber assembled all of these donations into a total of 96 bags and baskets decorated with holiday flair. 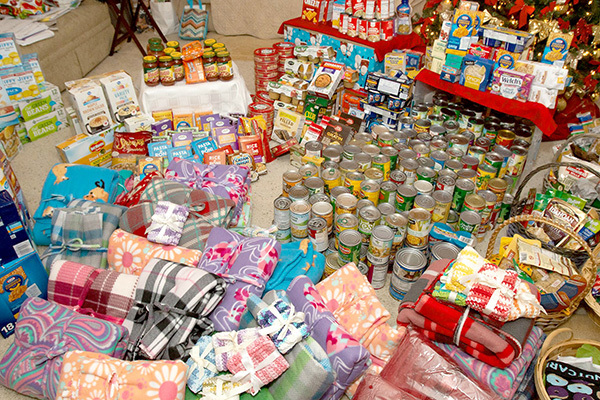 On the delivery date, the seniors received a hot turkey meal, with all the trimmings and pumpkin pie, three big cloth bags filled with items and a holiday basket that held toiletries and the cash and gift cards. These items were transported to the La Mesa Police Department parking lot by Carl Burger Dodge Chrysler Jeep RAM World and their staff members, Pablo Tapia and David Benavidez. Once in the lot, the items were distributed to the La Mesa Police Department RSVP officers to make the deliveries. Other sponsors of the project included Barona Resort & Casino, EDCO, Marie Callender’s, Pete’s Place, Silvermine Band, and Sycuan Casino. On Jan. 8, the San Diego County Board of Supervisors named longtime District 2 representative Dianne Jacob to serve as the board’s 2019 chair. Jacob will deliver this year’s State of the County address at 10 a.m., Feb. 6, at the County Administration Center Downtown. In the speech, she plans to outline proposals on a wide range of regional issues. “With two new members now on the board, Jim Desmond and Nathan Fletcher, we have a great opportunity to take a fresh look at many of the county’s biggest challenges,” Jacob said in a press release. The new supervisors were sworn in on Monday. They join Jacob, District 1 Supervisor Greg Cox and District 3 Supervisor Kristin Gaspar. Jacob was first elected to the board in 1992 and will complete her seventh and final term in two years, when she will be termed out. This is also the seventh time she has served as chair. District 2 spans 2,000 square miles and includes El Cajon, La Mesa, Santee and Lemon Grove, along with the communities of Campo, Lakeside, Alpine, Jamul and many others. 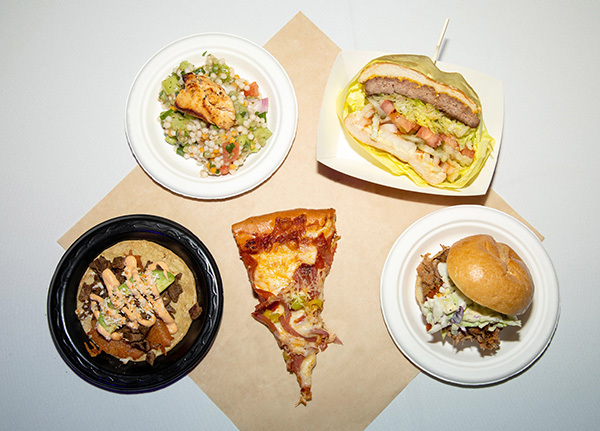 On Jan. 17, Sycuan unveiled The UnCommons, a San Diego fast-casual dining experience in its new hotel casino tower. The UnCommons market will feature five restaurants and a variety of cuisines. Sycuan partnered with several new restaurants to bring The UnCommons to life. The new restaurants that will be featured in the fast-casual market are Phil’s BBQ, Hodad’s, The Hangry Slice, Lucha Libre Gourmet Taco Shop and Luna Grill. Phil’s BBQ opened its doors in San Diego in 1998 with a menu that features barbecue classics ranging from baby back ribs to pulled pork sandwiches. 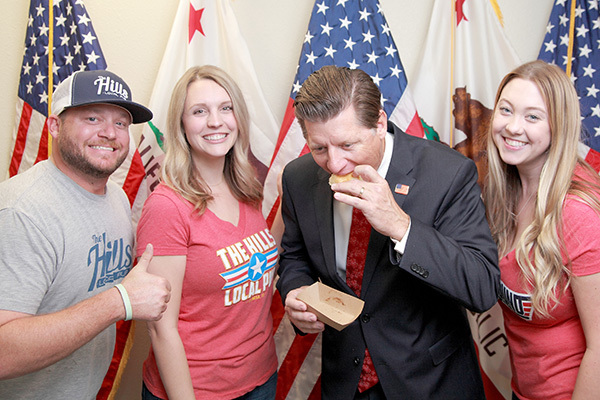 Phil’s BBQ has received several awards including Best Restaurant, Best BBQ, Top 10 Restaurants in the Nation, #1 Restaurants in San Diego and more. Since opening their doors in 1969, Hodad’s has become an icon in the San Diego community. Hodad’s was featured on an episode of “Diners, Drive-Ins and Dives” that garnered national attention and has been named one of the best burger joints in the nation. Though originally an Ocean Beach staple, Hodad’s has expanded over the years to include locations in Downtown San Diego, Petco Park and now, at Sycuan. Lucha Libre Gourmet Taco Shop was opened as a fast-casual Mexican restaurant in the Mission Hills neighborhood of San Diego 2008 by the Rojano brothers and offers good quality Mexican food with never-before-seen menu items, incorporating quality ingredients from family recipes, as well as improving classic taco shop staples. Lucha Libre has been featured in several national TV networks including the Travel Channel, Food Network, Cooking Channel and more. Luna Grill offers fresh Mediterranean cuisine such as signature kabob plates, gourmet salads, appetizers including hummus and falafel, wraps, desserts, craft beer and wine in a contemporary setting. The concept has now grown to 48 locations in Southern California, Inland Empire and the Dallas Fort Worth Area. Homeowners in the unincorporated areas of La Mesa will have a new option for expanding their properties. On Jan. 9, the San Diego County Board of Supervisors launched a program to encourage the development of granny flats and other small dwellings as part of a broader county effort to address the region’s housing shortage. To cover the loss of fees, the county will subsidize the program to the tune of $11 million over the five-year period. La Mesa Spring Valley School District (LMSVSD) board member Dr. Emma Turner is now also the president of the California School Boards Association (CSBA) following a vote by its members. CSBA represents more than 1,000 educational agencies across the state. 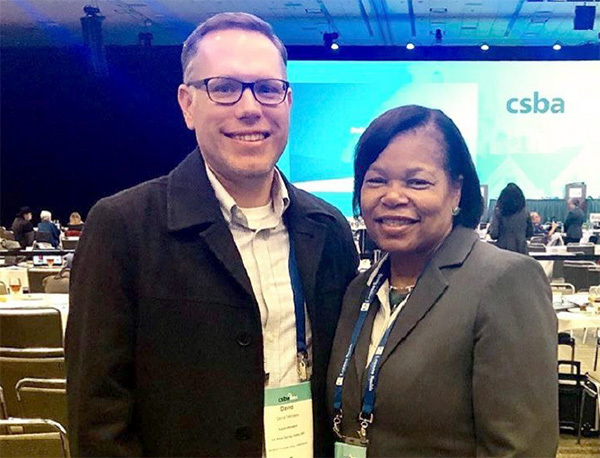 Turner has served on the LMSVSD board for over 12 years and was appointed CSBA president at the association’s annual education conference held in San Francisco. Turner attended the 5,000-plus-person event with LMSVSD Superintendent David Feliciano. Turner is known as a passionate and vocal advocate for children in the district and throughout the state, with a focus on the values of equity and educational access for all children, including access to early childhood education. For more information about Dr. Turner and CSBA, visit bit.ly/2DhccY2. The Grossmont Healthcare District (GHD) board of directors has elected its 2019 board officers. Randy Lenac, who recently won re-election to his second four-year term, was elected as 2019 board president. Virginia Hall was elected as vice president and Robert “Bob” Ayres was elected as secretary. Lenac selected Gloria Chadwick to serve as treasurer. Also serving on the five-member board is Michael Emerson, who served as board president in 2017 and 2018. Lenac, a resident of Campo, was appointed to the GHD board in July 2014 and elected to a four-year term in November of the same year. In November 2018, he was re-elected. Since 2011, Lenac has served on the board of the Grossmont Hospital Corporation (GHC), the operator of Sharp Grossmont Hospital. He also represents GHD on the Association of California Healthcare Districts board, a statewide organization representing health care districts. Hall, a retired registered nurse, was elected to the GHD board in November 2016. She worked in health care from 1973 to 2004, including at several hospital emergency rooms, clinics and research facilities. Chadwick, a retired psychiatric nurse, has served on the GHD board since 1998, when she became the first woman elected to the board in 22 years. In 2000, she became the first woman in GHD history to serve as board president. The Dehesa Valley resident has been re-elected to the GHD board five times, including most recently in November 2018. Emerson, a registered dispensing optician (RDO) who joined the GHD board in 2008, also serves on the Grossmont Hospital Corporation. The La Mesa resident was re-elected to four-year terms on the GHD board in 2012 and 2016. Prior to joining the GHD board, he served on the Grossmont Hospital Corporate Board beginning in March 2007. The Grossmont Healthcare District is a public agency that supports various health-related community programs and services in the East County region. For more information about GHD, visit grossmonthealthcare.org. On Jan. 22, the San Diego East County Chamber of Commerce announced the appointment of former board chairman Joe Mackey as interim CEO, while the organization continues its search for a permanent CEO following the departure of Eric J. Lund. Mackey, a longtime community leader and owner of XL Staffing Services, will lead the Chamber on an interim basis during the transition period. Mackey also was recently announced as the El Cajon Citizen of the Year. The Chamber board previously established a Search Committee to identify the next CEO, following the Jan. 11, 2019, resignation of Lund, who accepted an opportunity with another organization. The Search Committee is in the process of reviewing the several applications received thus far, while encouraging interested individuals to continue to submit their resumés. For more information about the job, visit bit.ly/2Rbrx03.